The big pressures of the Season are over, and even though there continues to be much to do, I feel as if I can pause to take a breath. I have been doing a great deal of reading about “mindfulness,” and listening to a multitude of voices who speak from their experiences about what this practice does for, in and through them. In attempting to participate in the practices about which I read, however, I find that they are not intuitive to me, or easy to get the hang of. I am attempting to take that pause, to allow this change of pace to be more mindful and attentive. On a trip to the section of beach where dogs can roam free, accompanied by my grandson, husband and wild dog Max, in the crispness and quiet, I sit shivering, but still, captured by the juxtaposition of motion and stasis: rolling waves, calm ocean farther out; dark mass of clouds softening into promising light; intrepid surfers and quiet watchers. How do I attend to Holy Presence in this moment? I begin with gratefulness–for being here in this moment to behold the beauty of the Creator in wave, sky and sand; to delight in the weaving of grand-boy, grandfather and dog, up and down the strand; for living in proximity to ocean and mountain both; for ample time to take a day to celebrate the birthday of this unique grandchild, with a love for creatures and a longing to wander untethered in as much wilderness as he can inhabit. Then with the prayer, Loving God, here I am, I turn my heart to questions for clarity: what do you want me to know? where do you want me to be? how shall I do the next right thing? I experience these prayers as seeds being sown in the garden of my heart, to be brought to fruition when the time in right. For the moment I need only to offer them, and sit with the panorama of Light and Dark before me, and wait. Like the roses in my garden behind and as the irises in my garden in front, the flowering of answers will appear in due season. The next morning I am in a sanctuary preparing for worship. 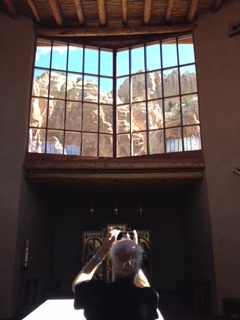 I am sitting with my husband, there is powerful music, stained glass, and a welcoming liturgy. But first to get quiet. I find that I routinely need to do things: rest in the truth that I am now a “person in the pew” not a worship leader, and that I need to recycle all the Grace that was extended to me by letting go of any bits and bobs of critique I might carry forward from my years of experience as pastor; then, I need to remind myself that I am gathered here with the people of God in worship of the Mystery we call God, even though I don’t have deep friendships or feel connected. I am ready now to pray, Loving God, here I am, and to see what how the Spirit will catch my attention and nourish my thirsty soul. Will it be words of a new hymn? will it be the reading of the Word by a sweet and adept 10 year old? will it be a line from the Word preached, a cadence sung by the alto soloist, an invitation to participate in the healing of the world close by? I tune my hearts to listen. The next challenge will be to bring my practice of mindfulness to a committee meeting. Will I be able to lay aside my resistances, my anxieties, my critical spirit long enough to be quiet, pray again Loving God, here I am, and then listen for what prompts the Spirit brings to me: is this a time to speak, to refer to my past experience, to jump into the fray or this is a time to call of the Spirit ot “set a seal on my mouth,” to listen to the deliberations with an open heart, while praying for the common good for all of us gathered? Loving God, here I am, make me mindful.